Ideally situated in a quiet area, no flooding which is only - 400 m from Hoi An Bus station, 2.5 km from the heart of Hoi Ans Old Town - a UNESCO World Heritage site, 2.5 km from An Bang beach and Tra Que Vegetable Village with nicely decorated house and bedroom made from natural local materials, beautiful garden and wonderful host. This magnificent house has every modern convenience and every detail has been taken care of to ensure you have the perfect stay. The house is modern with tasteful furnishings whilst retaining the style of a traditional Vietnamese home. 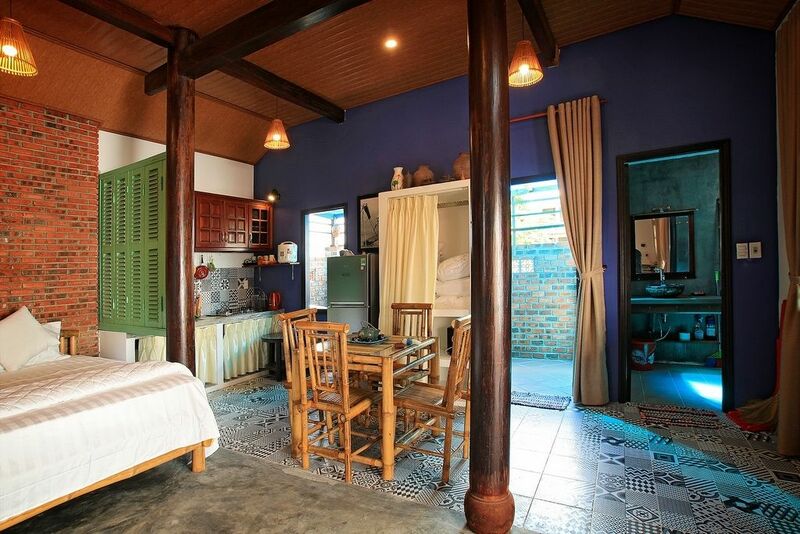 Our house is made of traditional environmental material of Viet Nam such as bamboo, reed, ebony wood, etc and fully furnish with modern technologies which ensure you have the best stay we could provide. The property features a big bedroom with 2 Queen-sized beds, tropical gardens. It is also very close to the Vietnamese host, he is a friendly, enthusiastic, clean, professional owner are always honored to serve you! It is an ideal accommodation for staying and relaxing. * FREE to use bicycles.